PREVIEW: 'The Walking Dead' Season Seven, Episode Ten "New Best Friends"
New friendships are forming on The Walking Dead as the group tries to figure out how to take down Negan. Here’s a look at episode ten, “New Best Friends”! Last week, The Walking Dead kicked off the back half of season seven with a slow intro episode. Father Gabriel left his lookout position to steal all the food and drive out of the safe zone. The strange boots we see at the beginning of the episode lead us to believe that Gabriel isn’t really by himself in that car. Later, Gregory and Ezekiel decide not to join Rick in forming a bigger group to fight Negan. Rick then left Daryl at The Kingdom because he knew that Negan would be heading to Alexandria to look for him. We saw Rick and company try and get closer to Negan’s compound, but were stopped by lines of cars and an explosive trip line along with a herd of walkers. The episode ended with the Saviors destroying the ASZ as they searched for Daryl, and Rick finding out that Gabriel was gone along with all the food. Rick, Michonne, Rosita, and Aaron go to the lake where they found all the food and end up following a trail but are surrounded by a new group of survivors. Even though they are severely outnumbered, Rick smiles as the episode ends. Well, since he just got turned down by Gregory and Ezekiel, he needs a large group of people willing to fight with him to get rid of Negan and this new group has lots of people and lots of weapons. New Best Friends seems to be speaking to two situations. In episode ten, we’ll see Daryl make a new friend in Richard, from the Kingdom. We know he hates Negan and Daryl will be a good ally to have, especially since he knows where the Sanctuary is. The title also nods towards Rick and this new group of survivors he’ll be talking to in the upcoming episode. Oh, and Daryl has a crossbow again! It’s not his old one–Dwight still has it–so New Best Friends could be alluding to this new friendship between Daryl and a new crossbow. We know we’re ready to see Daryl back in action after a first half that saw him beaten down beyond belief. 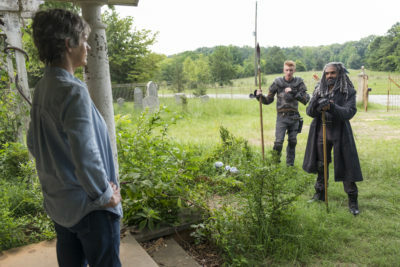 We’ll also be getting a look at what Carol has been up to this episode when Ezekiel pays her a visit! Take a look at the previews and stills below and get ready for more The Walking Dead!